Jerry wanted to be baptized in the Jordan River. He was baptized when he was a teenager, but to be baptized in the Jordan River… Oh what a privilege that would be. Jesus was baptized in this very Jordan River, we don’t know the location but it was this river. 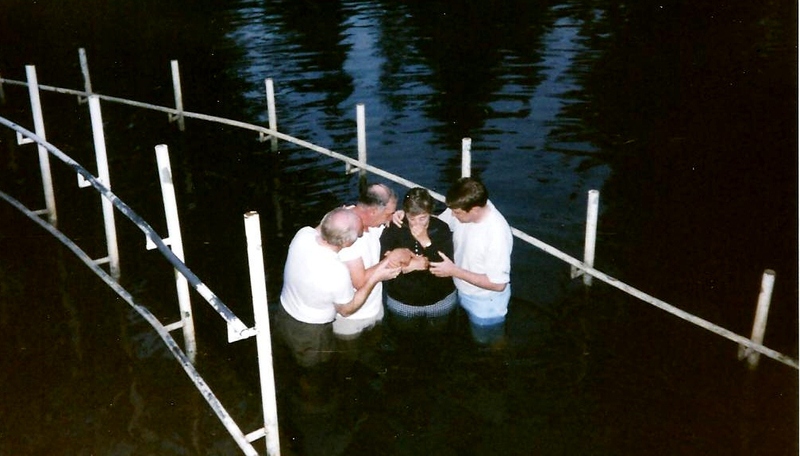 I had been baptized as an adult many years earlier and just didn’t want to do it again, even if it was the Jordan River. So it was decided, Jerry would be baptized and I wouldn’t. At the last minute it was announced that couples could be baptized together! Together? Oh, well, that put a whole new light on it. Jerry and I looked at each other and suddenly I knew I wanted to be baptized with him. So here we are: Dr. Williams, Jerry, me and Pastor Dave. It was like we renewed our commitment to God and to each other! A day neither of us will ever forget. This entry was posted in Asia, Family, Israel, Jerry, Me, Traveling and tagged Asia, Baptize, Israel, Jordan River, Travel, World. Bookmark the permalink.